At Baby Yale Academy, we believe that children learn best when they are having fun. For that reason, we have prepared numerous activities designed to promote fun and learning at same time. Arts and Crafts. This program allows children to express themselves openly, explore and be creative. Children will discover the “fun” in learning. Children are exposed to many different types of artistic medium, such as finger painting, sponge painting, clay, crayons, watercolor, etc. Students will learn through fun, simple crafts, that artistic possibilities are everywhere. Kids will be able to utilize their imagination to create lots of projects. Dramatic Play. We like to encourage the children to express themselves through dress-up. It’s not uncommon to walk in and see your child dressed up as a princess, a doctor, an astronaut or even a cowboy and so much more. The children are encouraged to imagine anything they might want to be and they can do it in our “imagination station”. Music and Dance. Studies have revealed that early music exposure can enhance early childhood development and spatial reasoning. Exposure to music during the early years of children enhances the learning process by promoting language development, creativity, coordination and social interaction. Students will learn the art of piano playing and music appreciation. 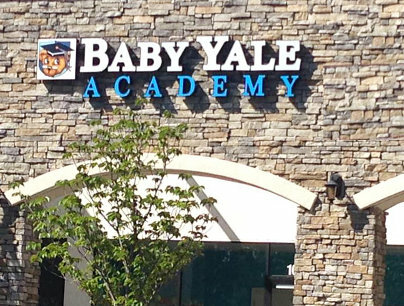 Baby Yale Academy will link music and intelligence enhancing children’s abstract reasoning skills. We will implement introduction classes where children will learn how to read music and study music theory through playing games. Children will be exposed to various types and styles of music, expanding children’s horizons. Parents will be invited to musical recitals and revues of Baby Yale Academy’s music and dance revues. Science Activities. Exciting hands-on and real experiments are common for our students. Children are encouraged to touch, feel and explore. The Prep Program will help the student know and name major body parts; recognize the names and characteristics of different animals and begin the description of the uses of the five senses. They will learn about the earth, moon, planets, stars, sun and space and so much more. Homework Club. In our After School Program, we offer an opportunity for children to do their homework once a day. A teacher is in the homework room to assist the children with their homework assignments. Please note that we are not a tutoring service, but we are happy to help in any way we can. Computer Activities. Research has shown that computer technology can be used as a tool to support early literacy. Our Computer Technology Program will introduce the Students to the world of computers. They will use simple computer programs such as pattern identification, drawing conclusions, computer literacy, visual and auditory skills, concentration, reading, visual and auditory skills, hand-eye coordination, word recognition, classifying; patterning, grouping, opposites, memory skills, critical thinking, etc. Directionality words, spatial manipulation, etc. Students will begin to learn consonants, short vowels and plural endings, etc. This program will create literacy activities that will lead to automatic recognition of letters of the alphabet; knowledge of letter sounds, the blending of sounds and the use of increasingly complex vocabulary. If you have activity recommendations or inquiries, get in touch with us at 925-308-7693.